Engaging with your audience is key to getting a result for your presentation. That’s because presentation audience engagement helps you to first secure your mission. And secondly, achieve your objectives. If you want your audience to know something because of your presentation then their engagement is needed. And if you want your listeners to do something once they’ve heard you then, again, you have to engage with them. You can achieve a good level of audience engagement in your typical business PowerPoint presentation with three simple techniques. 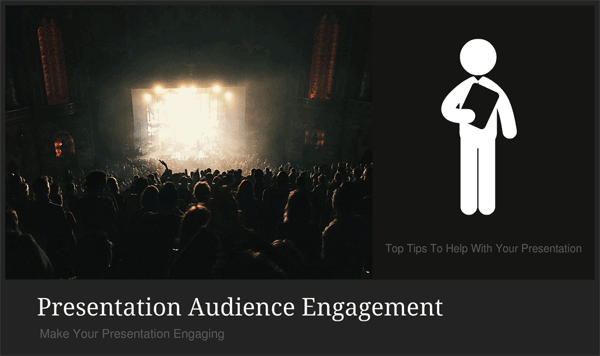 You can engage your presentation audience with these simple steps. Use illustrative slides with pictures and images and only a few words. Choose simple words and phrases. And, of course remember to speak with shorter sentences. Keep your voice interesting with modulation, tone, pitch and volume. Slides. Your slides should support your talk. On their own slides don’t count as your presentation. Without you they are nothing. So don’t be tempted to fill them with words or text (like this NSA PowerPoint presentation slide deck). If you need handouts, before or after your talk, use a word document or a white paper. Your job is to present. Talk and explain with words. It’s not your job to read your slides. And it’s not your job to help your audience to read your slides. Your slides should support your words. Supporting with pictures, images, illustrations, charts, maps or videos. There’s so much that they can hold. Because there really shouldn’t be room for many words. When your slides serve as a visual metaphor for your spoken word, then you are approaching presenter’s nirvana. Your words. Choose your words carefully. You want to consider their complexity, meaning and ease of understanding. Complex words might trip you up in mid-sentence. Then they can stall the flow of your argument. The meaning of your words might be open to interpretation; particularly if you use abbreviations or acronyms. And some words might possibly be misunderstood. Because, without understanding, there’s little chance of audience engagement. So, choose them carefully. Your voice. Aim for modulation in your voice. Few of us can lay claim to a Shakespearian theatrical tone…and that’s not a problem. So, for starters, aim to change the tempo of your presentation with a change of pace. Try slow and considered. Then try fast and furious before reverting to a characteristic pace. Whatever the event, alternation will engender interest. Aim to change your pitch with certain words or key phrases. That’s because your audience will notice your change of pitch. Your signal will engage their interest. Then, aim to change the volume of your speech. Use loudness for emphasis. Speak with a quiet voice and your audience will listen intently to hear your words. It’s sometimes an idea to repeat a phrase that you say really quietly. Because that way you give your audience the chance to listen again. These simple techniques can help you transform the most humdrum management presentation. From half an hour of polite attendance to 30 minutes of riveted interest. It’s really worth it. For find out more about presentation audience engagement, you can always attend a Time to Market presentation training course.